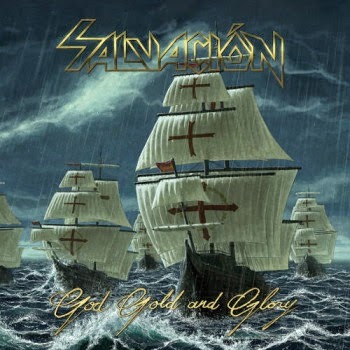 Salvacion are a power metal band from Wilmington, NC. They stick very true to the classic metal influences of the this sub-genre of heavy metal, emulating the likes of Judas Priest, Iron Maiden, and Scorpions. There are a lot of bands now going with the 'traditional' metal direction these days. Salvacion still have a unique sound thanks to the vocals of Nicky Sponsel, who channels a voice like the Scorpions' Klaus Mein into a music style that is more aggressive and intense than anything the Scorpions ever did. 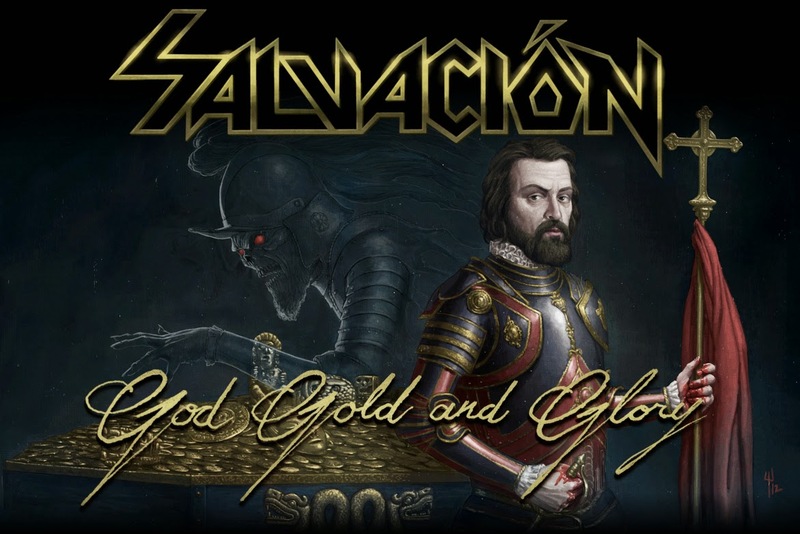 Their latest album, God Gold and Glory, delivers another ambitious element: it is a concept album. The theme focuses on Hernan Cortes and his conquest of the Aztec empire in Mexico. All the glory, and the contrasting atrocities of this brutal conquest are touched on in the lyrics of various songs on this album. The printed lyrics on the inside of the CD sleeve begin with a quote from Cortes himself. "I and my companions suffer from a disease of the heart which can be cured only with gold." Musically, God Gold and Glory proves to be a well-executed, focused, and talent-packed piece of music. The recording quality is top-notch, the playing is high in technicality, and the overall groove maintains a solid style throughout. A wide variety of instrumentation throughout keeps the listener captivated. Screaming guitar solos bring intensity, heavy distorted riffs keep rocking along with acoustic phrases and even keyboards in some places. The tempos can reach a fevered pitch, but there are slower tunes and passages included too. Sponsel's talent beyond the vocal aspect shouldn't be overlooked as he also plays guitar, bass, and organ on this recording! The other half of the creative team in Salvacion is drummer Carlos Denogean, who in addition to gang-style backing vocals also penned the lyrics along with developing the overall concept. Follow Salvacion on their facebook page! When Jeff Hanneman, legendary guitarist of Slayer, passed away on May 2nd, 2013 from liver failure I posted a poll asking you what your favorite Slayer album was. I hand picked several of their albums that I viewed as the most classic fan-favorite albums. In the end, a close poll revealed that 1988's South of Heaven was your choice to commemorate the life of Jeff Hanneman. South of Heaven has long been one of my personal favorite Slayer albums as well. Of course, who doesn't enjoy the purely insane tempos of their previous album Reign in Blood? 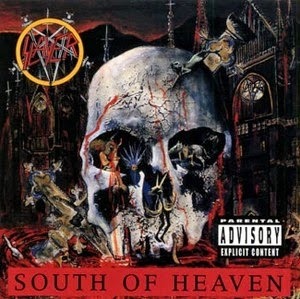 However South of Heaven provides a more unique sound and overall impression than perhaps any other Slayer album from their entire catalog. It has been well documented that this was the album where Slayer first chose to slow things down in terms of tempo and intensity in song structure and composition. However, they never stopped making their lyrical content any less evil. The result is one of the most haunting pieces of thrash metal of all time. South of Heaven is still filled with themes of war, the occult and the holocaust, but when these themes are combined with comparatively softer tones, and quieter elements than full-blown, non-stop, intensity, the effect is that your mind has more time to focus on the topics and imagery presented in the lyrics, which are still delivered in Tom Araya's sinister lower register. Songs like the title track, Silent Scream, and Behind the Crooked Cross will leave an unforgettable impression on your psyche once you make out the message in the words.